In Arwas Art of Glass the FranÃ§ois-EugÃ¨ne Rousseau and the Ernest-Baptiste Leveille examples appear side by side. Rousseau started with glass in 1867 and Leveille joined him as aglass decorator in 1877. Both examples differ in the technique used, both are also cameo's and the manner of applying the colour differs from your example. I can imagine an auction house attributing examples like this too them but I remain sceptical. They could have also attributed to the makers of this piece . Which also exists in a clear example with bubbles and just a few patches of colour. Whilst I understand your scepticism, I really don't think that you're comparing like with like here. The pieces that you allude to in Arwas's "Art Nouveau to Art Deco, The Art of Glass" pp 10 (not to be confused with the book I quoted earlier in this thread, for others benefit) are not the same beast at all. They are both from more sophisticated and technically accomplished ranges produced by both artists, which admittedly give a nod toward what we're talking about here, but employ cameo decoration across the surface of the vases, which largely masks the technique underneath. One of the difficulties here is that we are discussing illustrations, without the benefit of handling the item(s). Moreover, the items in question are rare, so inevitably there will be a divergence of opinion. It seems to be a red herring to bring in an illustration of an item from a known manufacturer (Monart), which has a different finish with the enamel on the surface of the vase, and, apart from having patches of colour, bares little resemblence to the piece in question. Further, although there may be another piece by the same company that is cased , having random patches of colour and bubble decoration, there is no mention of crackling within the glass - as is shown with the piece under discussion. Maybe I'm missing the point here, but is it that your just sceptical about the attribution, which I can appreciate and respect, or are we talking about mis-attribution by auctioneers? - which is an entirely different subject. ... the Venetians probably invented it and it was picked up again later around 1850. Frosted Glass, ... is one of the few specimens of Venetain work not previously made by the Egyptians and Romans; and not since excuted by the Bohemian or French Glass-makers. The process of making it, until recently practised at the Falcon Glass Works, was considered a lost art. So the term Pellat used was "Frosted Glass", indicating that somebody else at a later date came up with "Crackle" or "Ice Glass" or other names. The Falcon Glass Works was Pellat's company so he defintely laid claim to the "practise of the lost art" of Frosted Glass made by dipping the blown gather, "while nearly at white heat" in cold water. I must say that when I found the photo of the vase attributed to LÃ©veillÃ©,I was struck by the similarity of the glass colour,craquelÃ© and applied colour to that of my vase. 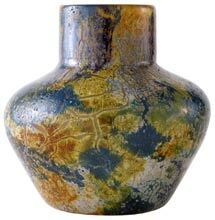 It was only after I photographed the vase that I noticed a small piece of green in one part of the decoration.That could be the "lichen" effect that you mentioned,Nigel. As I mentioned in a previous post,I almost certainly have another large dish which is WMF Ikora(Thanks to Frank for that link).That dish has a craquelÃ©-like finish when seen at a distance but close-up it is not craquelÃ© at all..more like a "spider-web" application on the glass but not through it. I'll post a photo of that one too when I get around to it. Page created in 0.589 seconds with 28 queries.